If you approached your bank or venture capitalist about starting a new company in a mature industry, it’s doubtful that you would score the funding you need. Why then were Amazon, Zappos, Chick-fil-A, Jetblue, and Apple able to create successful new businesses in recent years? The answer is each focuses on offering a great customer experience. The white paper “Total Experience Design – A New Model for Customer Experience” provides a simple yet comprehensive means of auditing your customer’s entire experience. See how companies that address the full spectrum of customer needs will be more valuable, profitable, strategically aligned with the market, and enduring. 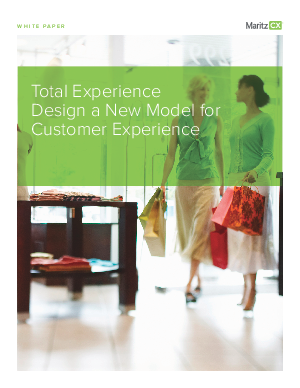 Fill out the form on this page to download your copy of Total Experience Design A New Model for Customer Experience.